The month of March and April was filled with events at French class. It was the month of Francophone festival. On March 23rd, we had the "Le defile"….We had to dress up as famous French people, characters or products. Our class choose to do "The universe of Tintin". It was amazing how we all co-ordinated on Skype and prepared for this event. Divya and Sangeetha arranged the moustache and beard for the characters. I was Tintin, so I had to go buy a blue sweater and some gel to get the spikes. The thought of dying my hair also crossed my mind. The show was a hit. We rocked and it was fun to stand up in front of such a crowd and speak. I had never done this earlier with so much confidence. So I am finally overcoming my stage fear too. People in AFB now know me as Tintin. After the Defile, we had the harlem shake. It was fun to dance crazily. The next day we played "Le ralley". Its a loose take on "Amazing race". 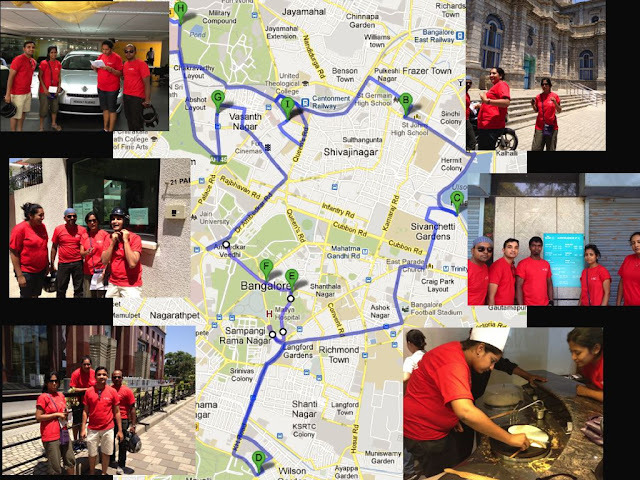 where you are provided clues for 8 different places and you have to identify them, ride around the city to get there and collect necessary informations and return. We enjoyed this a lot. Karthik, Manooshi, Sangeetha and me formed a group and we very well managed to complete all the places which involved a cathedral, airfrance office, a bakery, a french restaurant, UB city, The french embassy and Renault showroom. We came third. It was great fun! And then there was this video contest. I had not thought of participating but when my friend, Sush showed me a video shot in Jerusalem with a guy walking backwards from the camera, dismantling stuff and causing destruction which was then reversed, so it appeared as though he was walking towards the camera and creating stuff instead of dismantling them, i knew what i wanted to shoot. I liked the concept. I quickly wrote the story and requested my friends to act. They are a gem. They were so excited about it that it made more than half of my work easy. They were so enthusiastic about the whole thing that they rehearsed as many times as I requested and tried to improvise every time. Our professor too agreed to act and she was so very natural and gave her best shot in just one take after a rehearsal. She is brilliant in the film. Three cheers to all the actors in the film! I love how we practiced several times, how during a supposed to be final take, how Manooshi and Divya were given a wrong cup which they could not drop with a light accidental touch, how sangeetha, after her shot came to observe the later part but was caught on camera frame; how many times Karthik washed his face, how we convinced the cafe boys to act and finally they were replaced by Anupam who was so enthusiastic about the film and how people watched us and laughed thinking we were crazy; and how many times Rohan fell from the chair during rehearsals. Finally it all turned out to be a beautiful piece of work, which would not have been possible without a very talented ensemble. I won first prize for my film. Here it is! My first film! So mostly during the weekends, I am leaving in Alliance francaise de bangalore. One evening, Preethi and I enjoyed a musical concert there by a group from Reunion islands. They were simply awesome and played several interesting instruments that I had never seen before. The rest of April was filled with exams, sometimes it was exhausting but it was always fun to study together and more importantly be part of something interesting together.